Asparagus Season in Mallorca "What Grows Together Goes Together" Asparagus Season in Mallorca "What Grows Together Goes Together"
Wild asparagus grows throughout the island of Mallorca from Andratx to Alcúdia. The fine bright green spears start popping up around the beginning of March and continue through to early May. During these months you will see many Mallorquins and expats out searching for these delicious tender delicacies that mother earth has provided to us for nourishment and culinary uses. Bring 2 litres of salted water to boil and blanch asparagus for 1 minute. Then strain and place in ice bath for 1 minute to stop cooking. Strain and pat dry with paper towel and place in refrigerator for at least 1 hour. Chop shallots into small dice and place in separate bowl and now add the rest of the ingredients to the shallots and whisk for a minute then pour over strawberries and gently stir. Pour dressing over the asparagus that you already plated. Pairs well with local organic chicken or fish and even pork. This salad can be 100% local even using local extra virgin olive oil and sea salt from Mallorca. As a professional chef I believe it is my job to create and develop new dishes and ideas using local and seasonal ingredients and combine them in unique ways. I also believe that we, as human beings, we naturally enjoy what is in season. The oranges and strawberries right now in Mallorca are fantastic but the tomatoes are not; however, in August the tomatoes will be juicy and actually taste like tomatoes. There are super tasty and crisp spring onions right now in Mallorca that I love in a fresh salad or grilled. Mallorca has great potatoes as well and last week I came up with a fun dish with only asparagus, garlic and rosemary. Again this is a dish that is 100% local. In the place of potatoes, you can use mushrooms as mushrooms are grown here in Mallorca year round! Lightly oil, salt and pepper asparagus and place on hot grill until lightly browned. Take off grill place on a tray and cover with aluminium foil to keep warm. In medium sized sauté pan, heat 1 tbsp olive oil and add mushrooms, garlic, rosemary, salt and pepper. Sauté over medium heat for 10 – 12 minutes. Place asparagus on a serving platter then spoon mushrooms over asparagus and finish with a squeeze of lemon and serve. Have fun and make the most of asparagus season in Mallorca! 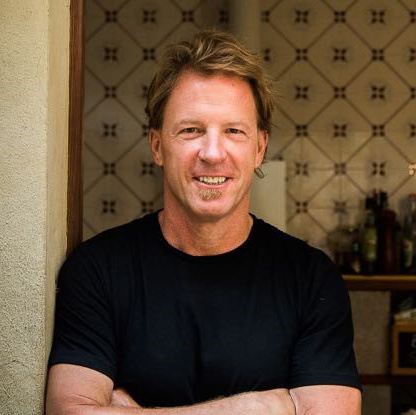 Chef Jeff Harter has over 20 years experience cooking throughout the United States and Europe. Jeff has lived in Mallorca for the past 11 years, now working primarily as a Private Chef to the rich and famous. He is inspired by the cultural and gastronomic traditions that have come to be recognised as the healthiest in the world. Before arriving in Mallorca, Chef Jeff was the executive chef at Alison Restaurant in The Hamptons. He is also well known for co-authoring “THE HAMPTON’S DIET COOKBOOK”. Before Jeff became the head chef at Alison he spent time working at El Bulli in Rosas and Arzak in San Sebastian. Jeff truly believes that a plant-based Mediterranean diet using seasonal and local ingredients and daily exercise is the cure to most all modern day diseases.